It is important to figure out and correct the shape of your brows before you start filling them in. You can do that with the help of a brow pencil. To begin with, place the pencil in a vertical line against the outermost part of your nostril. Start shaping from the place where the pencil touches your eyebrow. Similarly, you need to figure out where your brows should end. Hold the pencil diagonally from the outermost part of your nostril to your temples. The place where the pencil extends past your eye is where your eyebrows should ideally end. Note: In both cases, if you find hair strands past the ‘line’ formed by the pencil, shave them off. If there is a gap between the ‘line’ and the actual starting/ending point of your eyebrow, you have to fill it in tactfully in order to get perfect eyebrows. To get the perfect arch, hold your pencil’s end vertically against your nostril. While keeping the lower end of the pencil lined up against the edge of your nostril, move the upper part to the center of the eye. The point where the pencil hits your brow line is the natural arch of your brow, and will serve as the perfect outline for you to work on. Thicker, fuller, and shapely brows – now, that’s the goal! And here is a step-by-step tutorial on how to get them. Comb your brows using an eyebrow comb or a clean mascara wand. This is an important step, for you need to know the natural shape of your brows. Now, you can go for any of these for filling up your eye brows – pencil, eyeshadow/powder, or brow gel – or even a combination of these. For the purpose of this tutorial, we shall be using a combination of pencil and eyeshadow. Pencil definitely makes this whole process practically effortless, and the powder adds polish and gives a more natural finish. Start filling your eyebrow with the pencil at the point parallel to the inner corner of you eye. Your brows tend to be sparse at the point they start so filling them in looks extremely unnatural. Just go along with the natural shape of your brows and do not try to create an entirely different shape. To fill them in, use short, gentle strokes. Make sure that the pencil you are using is not too dark. The conventional rule is to go for two shades lighter than your hair color if you are a brunette and two shades darker if you are a blonde. Fill in the entire length of the eyebrow. Make sure that you do not go over-the-top with the filling in. 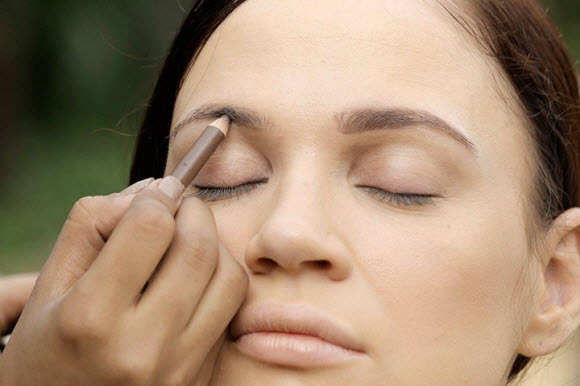 Just trace the natural shape of your brows, and thicken and intensify them just a little. Pencil strokes alone can look patchy, so we are going to use powder as well for the perfect finish. 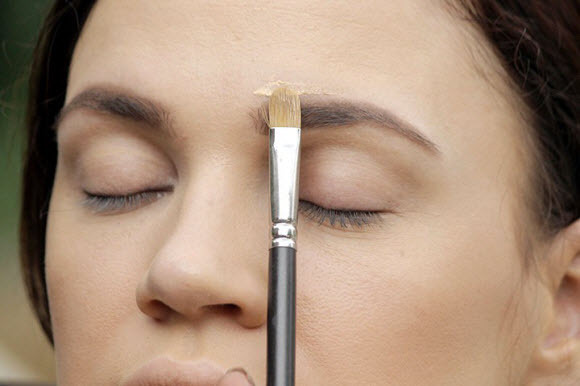 Use a brow powder for this step. If you don’t have some in your stock, you can always use a matte eyeshadow. Don’t use a shade that is too dark. 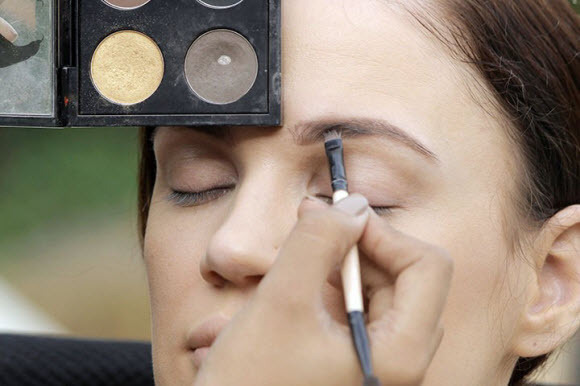 You can go for an angled brush or a smudge brush to fill in your brows. To make your brows even more defined, you can use a concealer/foundation slightly lighter than your skin tone on the upper and lower brow bone for a neater look. And you have the perfect eyebrows! Thick, full, defined, and polished – and natural-looking all the way! As you can see, just filling them in makes all the difference. Now that you know how to make eyebrows thicker with makeup, it’s time for you to practice it a little to perfect it. Don’t forget to share your experience with us in the comments section below.